PSG score nine: What you may have missed this past weekend. 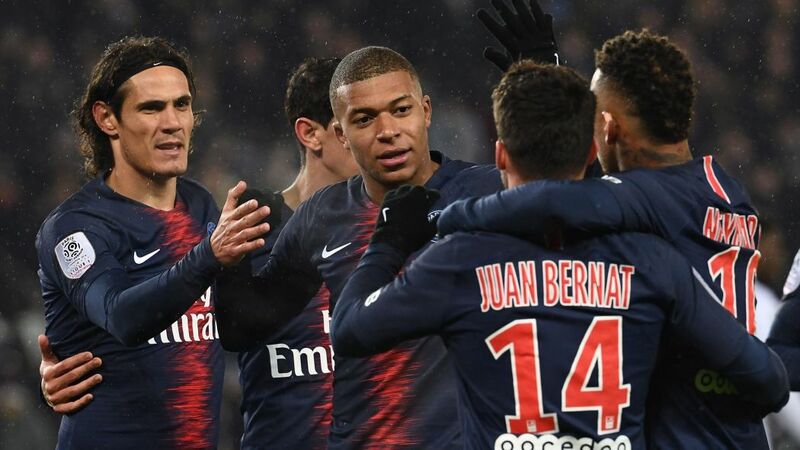 PSG continued their dominance in the French Ligue One, defeating bottom side-Guingamp 9-0 on Saturday afternoon. It was more of revenge after Vincent Rautureau’s side had eliminated the Parisians out of the League Cup just over a week agao. The game saw Kylian Mbappe and Edison Cavani each grab a hat trick while Neymar scored two. The other goal was scored by Thomas Meunier. The result means that Thomas Tuchel’s side remain 13 points clear at the top of the standings (53), having played two games less than their closest challengers Lille (40). Lille themselves were 2-1 winners over Amiens of Friday evening. They had to do it the hard way, coming from a goal down to register their 12th win of the campaign. Rafael Leao and Xexa struck for the home side after Ferney Otero had put the visitors in the lead inside five minutes of the game. For Lyon, they also came from a goal down to overcome St. Ettinne 2-1 in a fiercely contested derby at the Stade Geoffroy-Guichard on Sunday night. The home side took the lead on 21 minutes through Romain Hamouma but Lyon struck twice in the last 25 minutes to take win the game. First, Captain-Nabil Fekir slotted in from the slot on 65 minutes before Mouse Dembele scored deep into additional time to ensure that Lyon move into third, a point above Ettinne in 4th. For Marseille, they returned to winning ways with a 1-0 victory over Caen on Sunday afternoon. Morgan Sanson scored the only goal of the game on 47 minutes to ensure Rudi Garcia’s side win their first game in five. Elsewhere, Thierry Henry’s 10 man Monaco were trounced 5-1 at home by high-flying Strasbourg on Saturday evening. January signing Naldo was given his marching orders after only 7 minutes, meaning that Henry’s side would have to play the remaining 83 minutes a man down. Starsbourg took the initiative 5 minutes later, scoring the first goal through Ludovic Ajorque. It was soon 2-0 as Adrien Thomasson got his name onto the score-sheet for the fifth time this season. Monaco Captain-Radamel Falcao reduced the deficit on 22 minutes but it was all that Monaco smiled about as Strasbourg scored three more goals in the second half to win it 5-1 despite also seeing Stefan Mitrovic sent off with 22 minutes to play. Bordeaux, Toulouse and Angers were the other side who managed victories in Ligue One, this past weekend. All three won by a 1-0 score-line with Bordeaux defeating Dijon, Toulouse overcoming Nimes and Angers powering past Nantes. 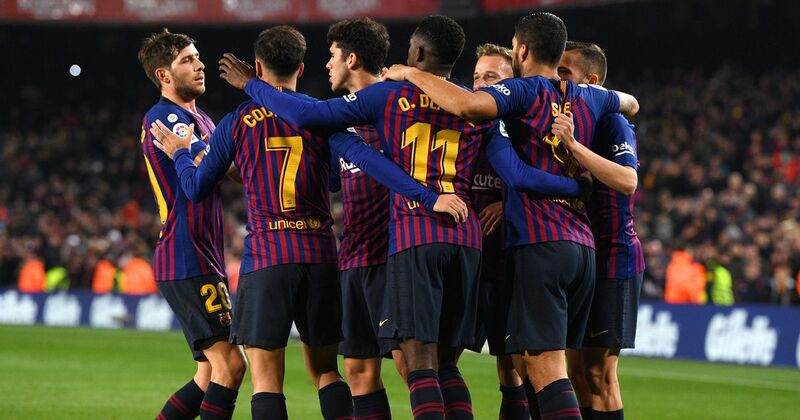 In the Spanish La Liga, Bracelona made it seven wins on the trot with a 3-1 home victory over Leganes. Ousmane Dembele opened the scoring on 32 minutes before Martin Braithwaite leveled matters for the visitors 12 minutes into the second half. With time running out, Luis Suarez scored Barca’s second on 71 minutes before substitute Lionel Messi grabbed his 18th of the campaign on 90 minutes. Victory for Braca ensures they stay 5 points (46) ahead of second placed Atletico Madrid (41) who were also victorious on the weekend. Atletico defeated Huesca 3-0 on Saturday with Lucas Hernandez, Santiago Arias and Koke all on the score-sheet. In the Capital, Real Madrid required two late second half goals by Luca Modric and Casemiro to overcome Sevilla at the Santiago Bernabeu. Casemiro scored the first on 78 minutes before Modric made it 2-0 at the stroke of full-time. The result means Madrid move into third with 36 points, three ahead of Sevilla (4th) who have now gone four games minus victory, losing both of their last two. Elsewhere, there were victories for Getafe, Real Betis, Valencia and Leavante with none of the bottom 10 winning. Getafe trounced 5th placed Alaves 4-0 on Friday, Betis were 3-2 winners over Girona, Valencia defeated Celta Vigo 2-1 away from home while Levante overcame Real Valladolid 2-0 on Sunday afternoon. In the Italian Serie A, Napoli moved to within six points of leaders Juventus, thanks to a 2-1 win over Lazio on Sunday night. Carlo Anchelotti’s side raced into a 2-0 lead at halftime thanks to goals by Jose Callejon and Arkadiusz Milik. Lazio pulled one back through Ciro Immobile with 25 minutes to play but their hopes of a comeback were shuttered by Francesco Acerbi’s red card five minutes later. Napoli now have 47 points with Juventus, who play Cheivo on Monday, still ontop with 53. For third placed Inter Milan, they were held to a disappointing 0-0 draw at home to Sassoulo on Saturday night. Inter are now 13 points off the pace. Atalanta and Parma were the only other winners on the weekend. Atalanta defeated Frosinone 5-0 away from home while Parma overcame Udinese 2-1 at the Arena Dercia. None of the 9 bottom 10 teams in action this past weekend registered victories in the Serie A. In the German Bundesliga, Borrusia Dortmund maintained their six point caution atop the standings thanks to a hard fought 1-0 win away to RB Leipzig. Axel Witsle scored the only goal of the game inside the opening 19 minutes to ensure that Lucien Favre’s side move onto 45 points. For second placed Bayern Munich, they were 3-1 winners away to Hoffenheim in the opening game on Friday night. Leon Goretzka scored a first half brace to sen d Bayern on their way before Nico Shulze pulled one back for the home side. Robert Lewandowski restored Bayern’s two goal caution and in processed, sealed victory with 3 minutes to play. Elsewhere, Monchengladbach, Frankfurt and Bremen were also victorious on the weekend. Gladbach had Alessan Plea to thank as they defeated Leverkusen 1-0 at the Bayer 04 Arena, Frankfurt were 3-1 winners over Freiburg while Bremen powered past Hannover 1-0. In the bottom half, Schalkh 04, Mainz and Fortuna Dusseldorf all won their respective fixtures.